Here are some 'while working' shots that I grabbed because I love these! They are so fun. I got this idea from another teacher in my district last year where I taught. She said it was a huge hit among her 5th graders. Well, I decided to try it with 3rd and it worked. 2. 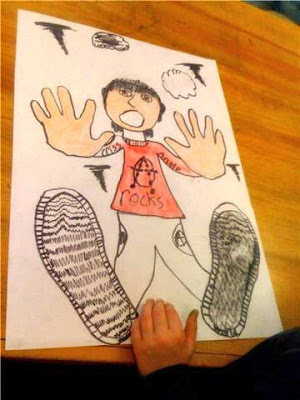 Have students trace hands facing outward, towards the top of the paper. A friend may help. 5. 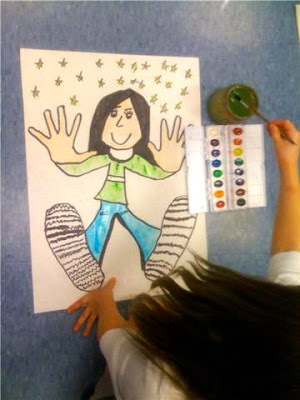 Then, add a neck, show them how to attach the arms to the hands, and the pants to the feet. 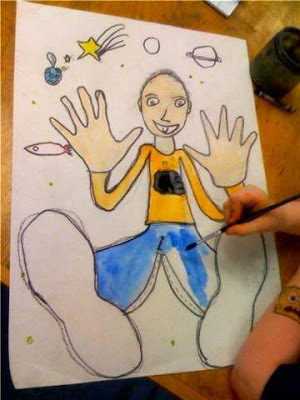 The arms and legs get larger as they get closer to the tracings of hands and feet. Draw details, details, details! 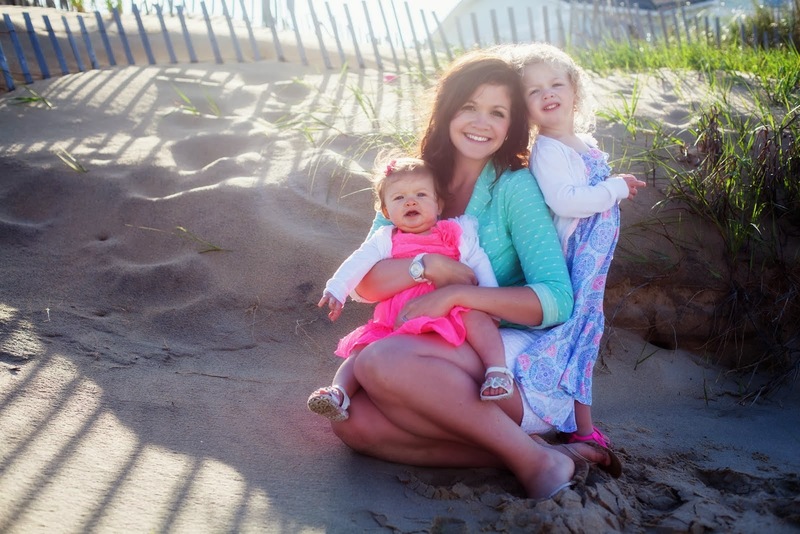 This blog was chosen as one of the top Art Teaching Blogs! I'm honored. Sorry I'm not around much this year. I'm snuggling and kissing baby cheeks instead of teaching art. But, I'll be back. For now, enjoy the other blogs listed on their site. My first graders are so much fun, and so much work :-) They have surprised me so much with these, they aren't even done, and they're BEAUTIFUL. They learned to "shade" a little, and mix their colors. 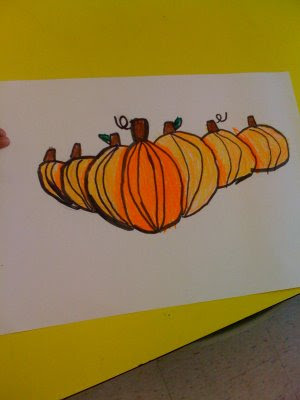 If you look closely they have mixed some yellow into their orange pumpkins, to make them look further in the distance. Very, very cool so far. The finishing touches will add leaf rubbings. Fall fun, eh? The kids ate this project up. I really had NO idea how much they would love creating their own cartoon characters! I have a worksheet that a previous teacher left (looks like it was scanned from a book, maybe?) that has some ideas of eyes, noses, mouths, heads and bodies of characters. It helps to get the kids started. They are free to use their own ideas, too-in fact, it's encouraged. We start off on a 9x12 manilla paper, and the students sketch 8 characters. Then, they have to choose their favorite 4. Then, they put their favorite 4 on a 9x12 white paper (we fold it in half twice to get 4 equal spaces). 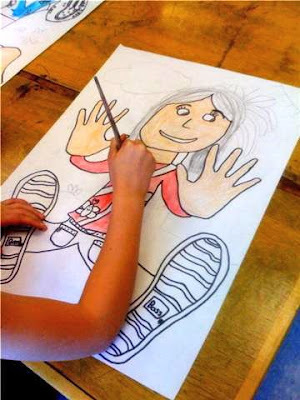 Students then outline, color in prismacolors, add a border to each character (that goes with the theme), and create a name for their character. They are then cut into 4, and mounted on a black piece of paper. I didn't realize how much they'd LOVE this project...seriously, they were obsessed! 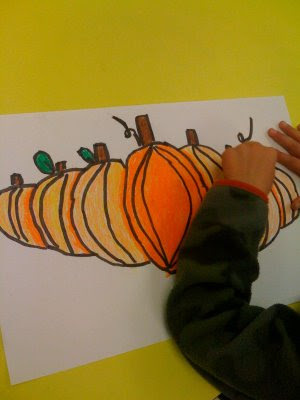 But, it was great for hand-eye coordination, to get their little minds going creatively, and to use colored pencils. 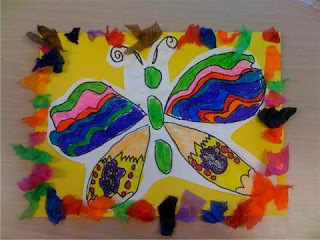 I actually got inspiration to draw this butterfly from one of my 1st grader's shirts last year. It had the prettiest butterfly on it, that was a very simple line drawing. 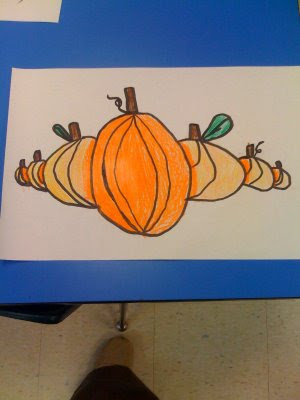 I decided to teach my 1st graders how to draw it (again, this year! 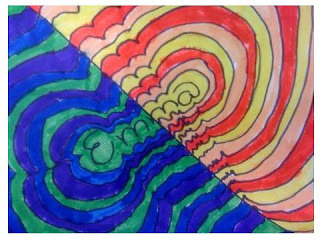 ), and then we added lots of different line designs using our sharpies of course. 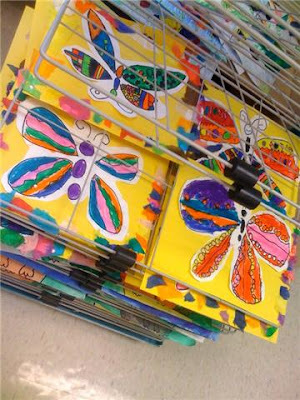 The students were to color the butterfly with markers, trying to keep two of the same colors away from each other. Then, we cut them out (with a "bubble" around it), and glued them on yellow paper. You may use whichever color you'd like-but yellow definitely pops for spring. Next, we added a tissue paper border just for fun and to add texture. This was a great 2-day lesson, and they look gorgeous! 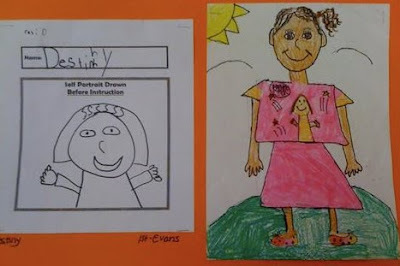 Get a masters in education to better teach your 1st graders. Seeing this lesson, all framed out, honestly--makes me want to cry happy tears (or it could be the hormones from pregnancy--whatever!). 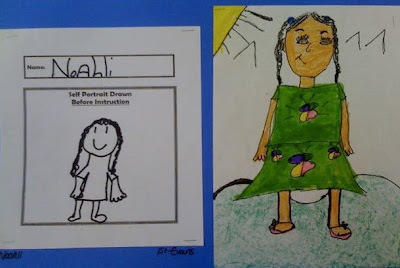 The reason is due to the before and after effect these self-portraits have. They are learning! I love it! The proof is there. See? 1. Give all students a "before" sheet. I make mine up on the computer and photocopy. Then, I label it, "Self Portrait drawn before instruction". I give each student a sharpie, and tell them to draw a picture of themselves. 2. 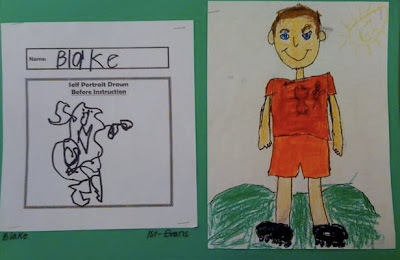 Hand out any size paper you want to have them do their self portraits on. The only thing I recommend you doing ahead of time is tracing their head's first. REASON BEING: If you have ever tried to get all 1st graders in a classroom to make something the same size--you know the chore that is. So, I cut out a little time and just did it myself. It's worth it, trust me. 5. Continue on with the body. Talk about the body parts and things they typically used to forget when drawing their "old" people [I continually emphasize how good they'll be at people after this! ], and how we DO indeed have necks, arms that flop down by our side and that don't stick out straight, fingers (and not dagger's! ), etc. 6. Give them free reign to make them look like "them". I let them use markers to decorate their shirts and pants, shoes, etc. Take everything STEPS. Trust me. This lesson may take a few weeks--but the results are worth it.